ANIMAL ANTICS LAMB AND RICE WITH VERM-X 12 KG Ideal For Those Wishing to Explore A Natural Way of Repelling Internal Parasites. *Ingredients include Garlic, Peppermint, Common Thyme, Cinnamon, Echinacea, Quassia, Tansy, Cayenne, Fennel, Cleavers, Nettle, Slippery Elm. Verm-X is ideal for those wishing to explore a natural way of repelling internal parasites and adopting organic protocols. Verm-X products are acknowledged by the Soil Association for use on organic farms. All Verm-X products are manufactured under licence by expert producers in the UK and Europe to the highest standards. Our pelleted products are produced in one of the UKs only low temperature pelleting facilities that prevents damage to the ingredients. 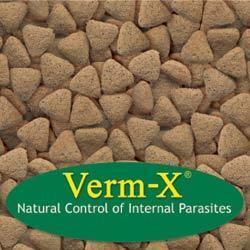 Verm-X is highly palatable and has no known resistance. Over 70% of Cats and Dogs are not routinely treated for internal parasites. Over 80% of consumers buying Verm-X products are not replacing another brand. Fresh extracts and tinctures are processed on-site within hours of being harvested. You may also be interested in VERM-X dog treats in our treat section.